Felons must look at a different career path in finding a job upon their return to society, including returning to school for additional education. After their experience with the legal system during their trial and incarceration, some felons might consider a career in the legal field. 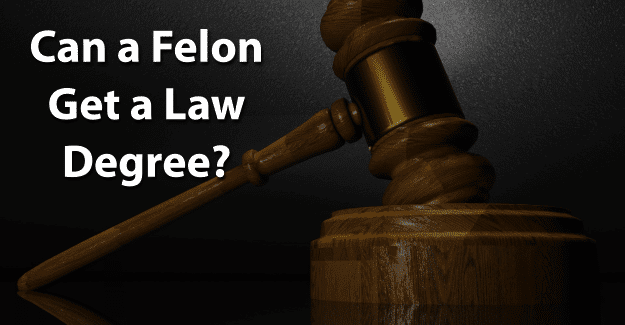 This blog post will address whether or not a felon can get a law degree. How Much Does Someone with a Law Degree Earn? Law, or legal studies, was the first academic degree offered at universities. A law degree is a good way to prepare for a career as a lawyer. Someone who completes a law degree advises clients on legal issues. A Master of Laws degree is a higher level that takes one year beyond the Juris Doctor and allows someone to specialize in a particular area such as tax law or environmental law. A Doctor of Juridical Science is the highest degree, requiring three years to complete, and will allow someone to teach as a law professor in a college setting. Becoming a lawyer usually takes seven years: four years of undergraduate study to earn a bachelor’s degree followed by three years of law school. Most states require lawyers to complete a Juris Doctor (J.D.) degree from a law school accredited by the American Bar Association (ABA). Most law schools require applicants to take the Law School Admission Test (LSAT) to apply for law school. To practice law in any state, a person must be admitted to that state’s bar under their rules. The requirements vary by state. Individual state requirements can be found at the National Conference of Bar Examiners. There were about 792,500 lawyers in the U.S. in 2016. According to the U.S. Bureau of Labor Statistics, the median annual salary that requires a law degree is $118,160. Experience and area of the country will also influence the salary a lawyer receives. Those with a law degree working on the East or West coast will typically earn more than ones employed elsewhere in the country. Overall employment of lawyers is projected to grow 8% from 2016 to 2026, about average for all occupations. Legal work demand is expected to continue as individuals and businesses will require legal services. A felon can pursue any college degree he or she wants. Although 60% of colleges consider criminal history in their admissions process, there is no standard policy regarding a background check. At many colleges the background check consists of only one question on the admission application regarding whether or not the applicant has any convictions. All law school applications will ask about criminal history. Each law school sets its own policy as to whether applicants with felonies are eligible for admission. In the majority of states, a felony conviction does not necessarily eliminate an applicant from admission to the state bar and obtaining a license to practice law. Before granting admission to its bar, each state will evaluate an applicant’s character and fitness to practice law using its own set of rules and regulations. In all other states, a felony conviction is not an automatic denial for admission so long as the applicant can prove current good moral character. As part of the application for the state bar exam, a candidate must to fill out a character and fitness application and provide detailed background information about his or her criminal history. The standard of character and fitness is applied because a lawyer should be one whose conduct justifies the trust of clients and the courts. A record demonstrating a significant deficiency in the honesty of an applicant may constitute a basis for denial of admission. It’s important to be honest when filling out an application for licensure as a lawyer or for a job. If a felony isn’t disclosed but is found on a background check, this constitutes fraud and is punishable. It is a crime to falsify any application, which could result in being sent back to prison. In order to be successful in obtaining a law degree, it is essential for felons to be honest about their background. They are already viewed with negative perceptions of being dishonest, untrustworthy, and unwilling or unable to follow directions from authority figures. Having their record expunged can give them the chance needed to begin with a clean record and succeed in getting a law degree and beginning a new career. Expunging a criminal record allows anyone to honestly state on an application that he or she has not been convicted of a crime. It is challenging, but it might be worth it for a felon wanting to get a degree in law. Giving him or herself the best chance for success by having his or her record expunged and being persistent in pursuing a degree could make a critical difference. Many employers have found that felons make good employees. There is no reason for this to be different now. What do you think about this blog post? Have you or someone you know been in the situation of trying to get a law degree with a felony? What was that like for him or her, and how did they achieve success? Please tell us in the comments below.